Sailing in Maui is really something everyone must do. The warm winds of Maui are perfect for speeding across the water, and the Kai Kanani's stable catamaran will keep you from spilling your Mai Tai. There are a lot of options when deciding to take a leisurely boat cruise in Maui, and we recommend the Kai Kanani for your sailing experience for many reasons. 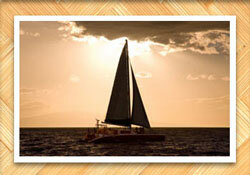 There are dozens of boat charters in Maui waters and only a few offer sailing. When the sail is up and powering you through the water, you experience pure peace. No loud engine or fumes will ruin your relaxation. Not only is sailing relaxing, it also allows visitors to share a deep cultural connection with the Hawaiian and Polynesian people. Only one boat has a Makena Beach Entry. The Kai Kanani offers incredibly easy access to those staying on the South Side of the island. You walk directly from the sand in front of the Maui Prince onto the boat. 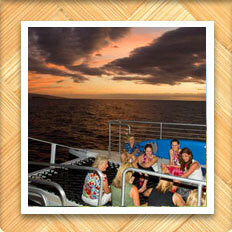 Another thing we like about Maui Fun Charters is the ability to charter them for trips other than for fishing. You can get a super low price to go whale watching (in season), dolphin watching, sunset cruises, snorkeling, and just about anything where you want privacy on the water. The Crew is outstanding to say the least. From the captain to the crew, you'll feel the Aloha and enjoy nothing but good vibes. Everyone works very hard to make sure you're experience is nothing but sensational. They're friendly and professional from beginning to end. Kai Kanani tours range from snorkel trips to Molokini Crater, sunset cocktail cruises, and even to go whale watching in season. The Kai Kanani is one of the newest boats on the island and its noticeable. Everything is clean and top of the line. The sailing technology aboard the Kai Kanani is unparalleled. Reservations are easy to make for the Kai Kanani. 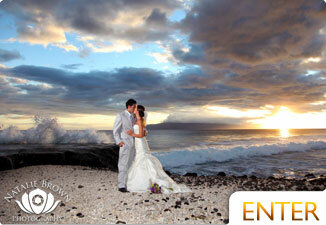 Call 808.879.7218 to book your seats. We have to take a moment to discuss the quality of the bar and food for the cocktail cruise. We've been on most boats on Maui and have to agree that the Kai Kanani offers some of the best Pupus (appetizers) out of any of them. This is the real deal. Often food on boats becomes a second thought, but with the Kai Kanani, you experience the higher end of everything. 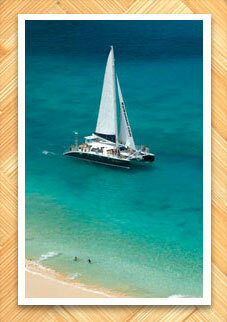 You can see more tours at Maui Sailing. Photos courtesy of Greg Hoxsie Photography. All Rights Reserved.